Power lines deliver electricity through Enfield in this September 2017 file photo. Maine electricity customers paid $77 million more than they needed to on power from 2012 to 2016, according to a new report from Maine utility regulators. 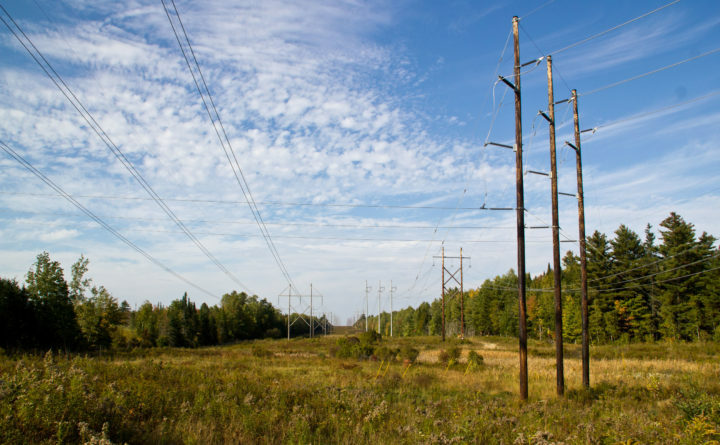 The electricity retailers are separate from utilities such as Central Maine Power Co. and Emera Maine, which maintain the poles and wires that transmit power. Maine’s largest retail supplier, Electricity Maine, lured hundreds of thousands of customers with prices lower than the state-regulated “standard offer,” before raising its average price and taking in about $58 million more than if its rates had matched the standard offer, from 2012 to 2016. The PUC’s report confirmed the reasons lawmakers passed consumer protections last May to limit rate increases and bar companies from automatically re-enrolling customers into new contracts. The law also required the commission’s cost comparison report. The PUC says it expects to propose rules implement the new consumer protections in March. “Residential customers appear to be paying more for their electricity when they’re with a competitive electricity provider unless they are really researching their options,” said Kiera Reardon, a consumer adviser with the Maine Office of the Public Advocate. The PUC’s report does not assess how much retail suppliers are costing Maine small business customers, though it appears that group of customers added another $21 million in costs above the standard offer. In writing its report, the commission used federal data from the U.S. Energy Information Administration to assess retail supplier prices and sales. Data reported directly by the state’s utilities also include retail supplier sales to small businesses, which generally pay the same rates as home customers. Based on the average price difference taken from federal data and the state sales figures for home and small business customers, those two groups spent as much as $98 million more with retail suppliers from 2012 to 2016 than if they’d gone with the standard offer. The legislature directed the PUC to study only the impact on residential customers. As their regulator, the PUC could have requested additional pricing and customer enrollment information directly from competitive electricity providers operating in Maine. But Lanphear said the commission declined to ask them for that information since it has allowed figures like revenue, customer counts and total power sold to be confidential in those companies’ annual reports. “If we had gone to them and requested it directly, we felt they would have made the same request” to keep the information confidential, Lanphear said. Retail suppliers have regularly objected to the kinds of analyses done by the Maine PUC, arguing that their offerings aren’t directly comparable with the standard offer power. Retail suppliers can also offer renewable power or other perks, but the PUC report found not many do. One supplier, Clearview Electric, offered only a renewable power plan. Tim Schneider, who served as the state’s public advocate when lawmakers passed the consumer protection law, said the commission’s report fell short. Last year, in a BDN opinion column, Schneider wrote that Maine should close the retail electricity market to residential customers if regulators found the companies were not offering either savings or innovative power supply options. At their peak in mid-2013, retail suppliers had about 221,000 residential customers, or 29 percent of the market. As of July 2017, they had 123,728 customers. Read the PUC’s full report below. Correction: A previous version of this report incorrectly described state energy use data and, as a result, mischaracterized the scope of the PUC report, which covered residential power use. The broader state data includes both home and small business customers while energy use data from the U.S. Energy Information Administration only includes home customers.